This may have the most intense flavor per spoonful of anything I have ever made. The flavor is so rich and intense that it is amazingly filling and satisfying. I know I will make this again and again. I was inspired to make it by the fact that I had four rutabagas in the crisper that were losing their crispness. I knew I had to make something and they were no longer crisp enough for great salads, so I decided to make a soup. I looked online for some soup recipes, but most called for cream and I almost never have milk or cream. I was pretty sure I could come up with a non-dairy version that would be pretty good. To start I sautéed a medium sized yellow onion in 2 tbsp of olive oil with some salt and pepper. I added 1 full inch of fresh ginger (about 1.5 tbsp) and 2 tsp of cardamom. I let sauté until they onions were tender and a soft golden yellow. Meanwhile, I peeled and chopped up 4 rutabaga and 2 turnips into about 1 inch cubes. The turnips were the adorable little small, round ones, not the big ones. I thought they might add a bit of pungent brightness to the soup. When they were all cut up, I tossed them in the pot and added salt and pepper. I then added 24 oz of broth. I used chicken broth I had made from some roast chicken and froze. 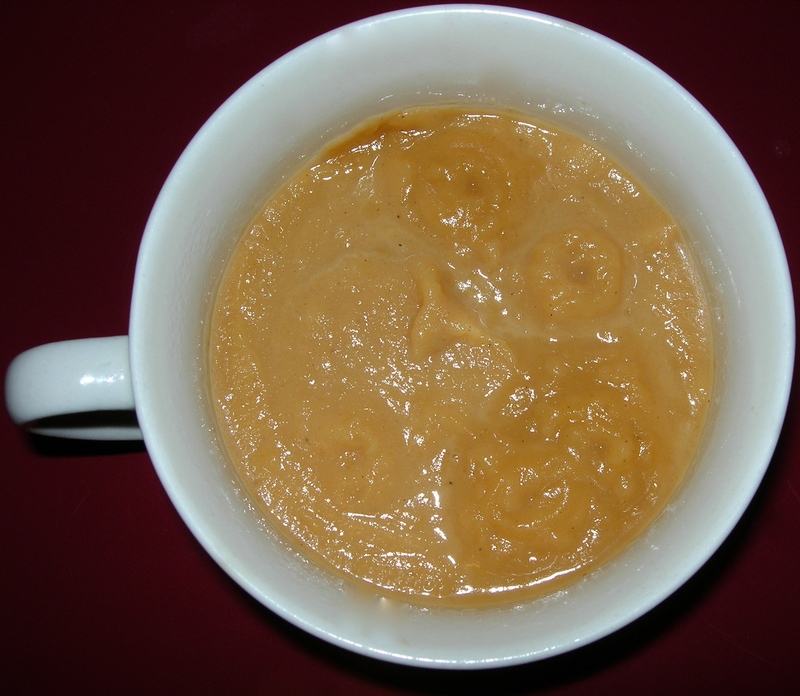 You could use a mushroom or vegetable broth for a vegan alternative. The point is to enrich the vegetables with flavor from the broth – but the particular broth flavor is less critical. While they cooked, I peeled and cubed two tart apples. I happened to use 2 Fiji and 2 Granny Smith, but so long as they are tart apples and not sweet ones like HoneyCrisp or bland ones like Delicious, the particular strain is not important. When the rutabagas and turnips were tender, I added the apples with some salt and pepper. I then juiced two fresh lemons. I added the lemon juice and 1.5 tsp of cayenne and salt and pepper to taste. I am sure you note that I am adding salt and pepper over and over and over. This does not make an over-salted dish, because I season to taste at each stage – and adding with each new stage of cooking, the flavor actually becomes rich with less salt and pepper. Let it cool a bit and puree with an immersion blender. It will be creamy and smooth and delicious. The brightness of the lemon, the little bit of cayenne and the earthy richness of the root vegetable and the delicious aromatic cardamom combine into an intense and delicious flavor that is hard to describe. It’s has a tiny bit of heat, but it’s not spicy. It has a bit of zing, but it’s not sour. It’s just sublime. This made 2 quarts of soup – enough for several more than a single serving. It can easily be made vegan and will be just as good. 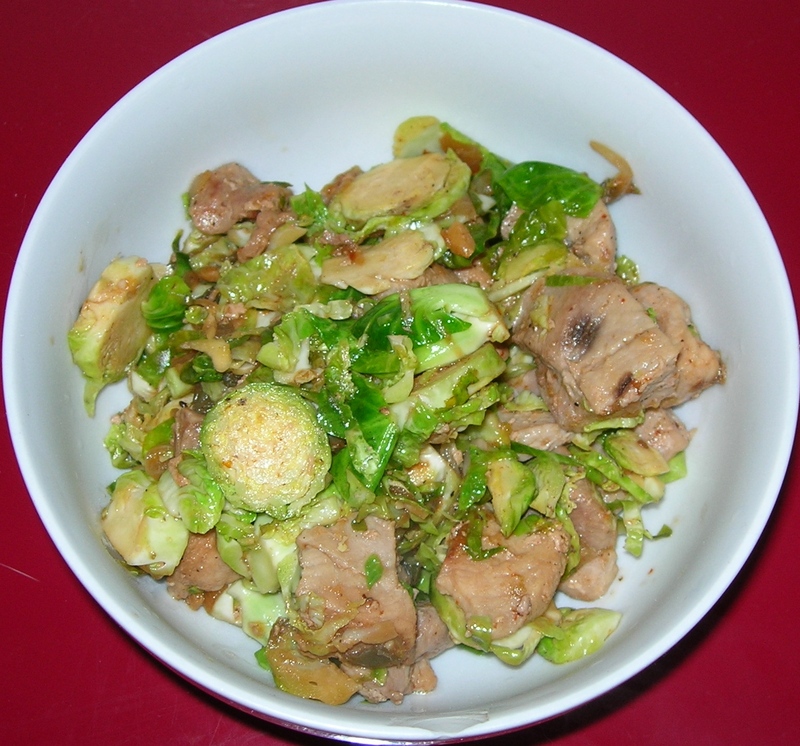 I know pork and cabbage are great companions, so it made sense to me that Brussels sprouts would love pork, too. To make this, I first chopped up 1/4 cup of yellow onion and minced about 1/2 inch of fresh ginger. I heated 1 tbsp of olive oil in a non-stick skillet and sautéed the onions and ginger until tender. 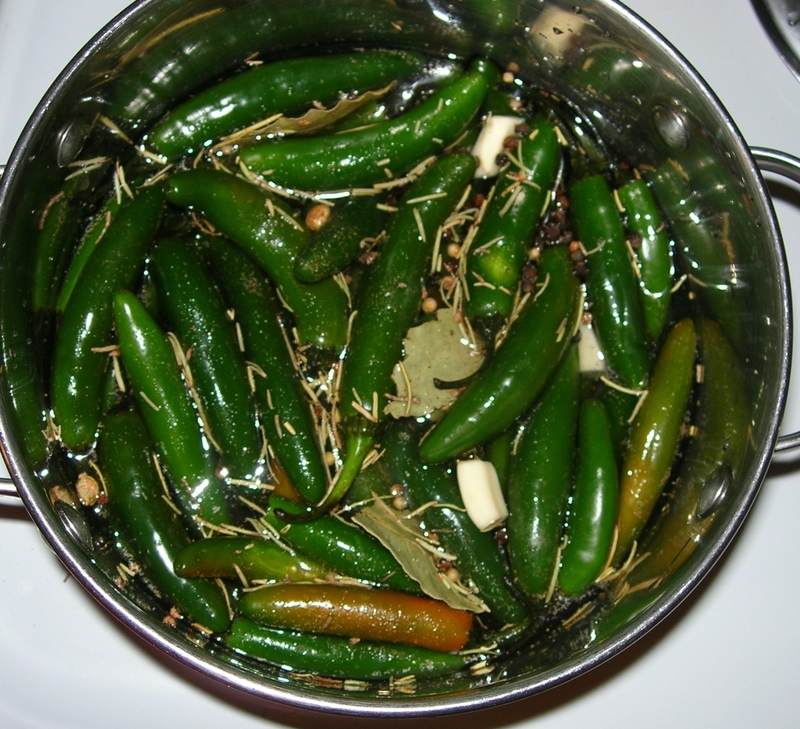 I added 2 of the pickled Serrano chilies I had made, diced up to add some heat along with some salt and pepper. Meanwhile, I took a 6 oz boneless pork loin chop and cut it into bite size pieces and added that to the onions and sautéed. While the pork cooked, I cleaned and sliced up 2 cups of fresh brussels sprouts. When the pork was a few minutes shy of done, I added 2 tsp of soy sauce and a generous squirt of Sriracha, stirred and then added the brussels sprouts and some salt and pepper. I put a lid on it so that the steam would help cook the veggies quickly. After a couple minutes, I lifted the lid, stirred some more and then let cook until done. I cooked until the brussels sprouts were tender, but still toothsome and not the least mushy. There was plenty of heat and the blend of ginger, chilies, Sriracha and soy gave this a distinctive SE Asian flavor – with multi-layered spicy heat that was not overpowering. The brussels sprouts absorbed the rich flavors while still remaining fresh and earthy. It was simply delicious and very easy to make. I have my groceries delivered and sometimes the person packing my order makes a mistake as when I was recently sent 2 pounds of serrano chiles rather than 2 chiles. Oops! Well, I did cook with more serranos this month than usual, but there is no way I was going to use them all up before they spoiled, so I had to figure out what to do with them. I thought about making salsa, but just as I was about to do that, it occurred to me that some pickled peppers might be perfect. So here goes. The pickling liquid is always a one to one ratio of water and vinegar. You only want enough liquid to cover the chiles so what I did to get the right ratio was add 1 cup of water, then 1 cup of vinegar, then 1 cup of water and 1 cup of vinegar until the chiles were covered. In this case, it took 2 1/4 cups of each. For a bit of deeper flavor, I used 1 cup of white wine vinegar in place of one of the cups of white vinegar. This is 4.5 cups of liquid The ratio of salt and sugar is 1 TBSP of each for each 3 cups of liquid, so I used 1.5 TBSP of salt and sugar. 1.8 pounds of serrano peppers, cleaned and pricked with a knife, about 3 to 4 times for each pepper. I put them all on to boil. Once it reached a rolling boil, I reduced heat and let simmer for 10 minutes. Then let it cool, put it in containers with brine, covered and refrigerated. I can’t really tell you how it turns out for a week – after the flavor has had time to fully be a absorbed, so I will update when they are ready. Update: After 36 hours, they are amazing! 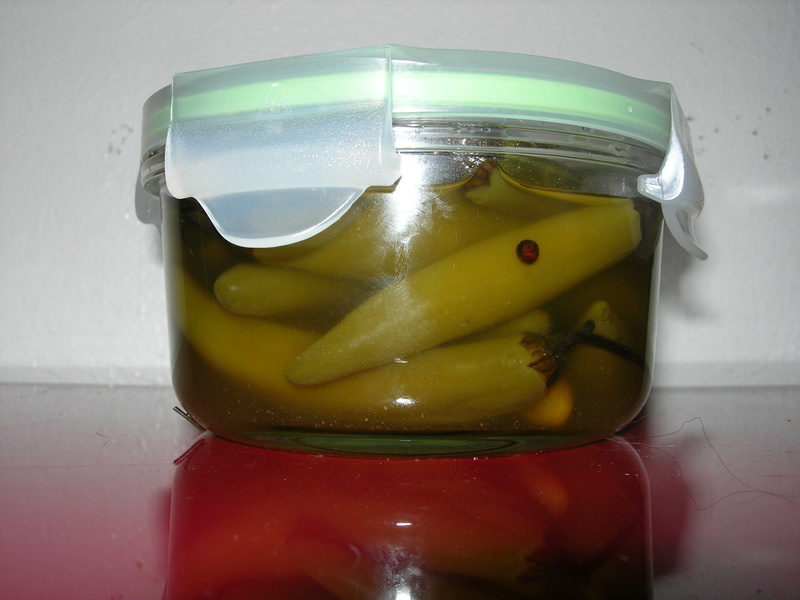 They have that combination of sweet, sour and heat that you associate with pepperoncini, but with with about double the heat.